Because of the Adventure aspect of this theme, I decided to incorporate an additional theme for the party to make it interesting… that of a RAINBOW. And with the help of Pinterest got loads of ideas! My daughter has realised that a birthday is not a birthday without a cake. 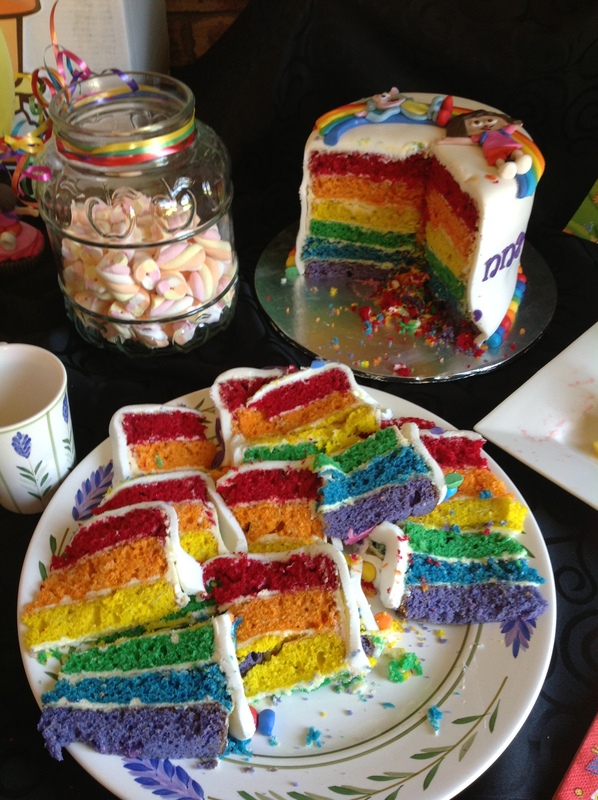 Our fantastic cake maker made a delicious vanilla cake with each tier a different colour of the rainbow. The decor on the outside had Dora and Boots sliding down a rainbow. 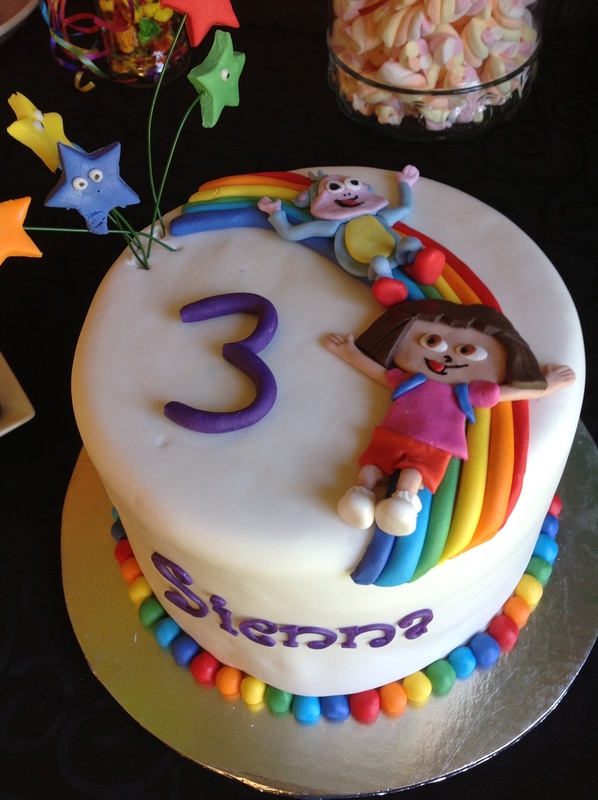 She also made my daughter her very own cupcake with Dora, complete with detail of the backpack on her back! The ceiling was covered in rainbow coloured balloons, it also had the effect of making the ceiling lower and feeling like you were under a rainbow. We hired tables and chairs and I used cheap fabric I had bought at a fabric shop with rainbow coloured polka dots as table cloths. We hired chair covers in each colour of the rainbow from one of our party suppliers. 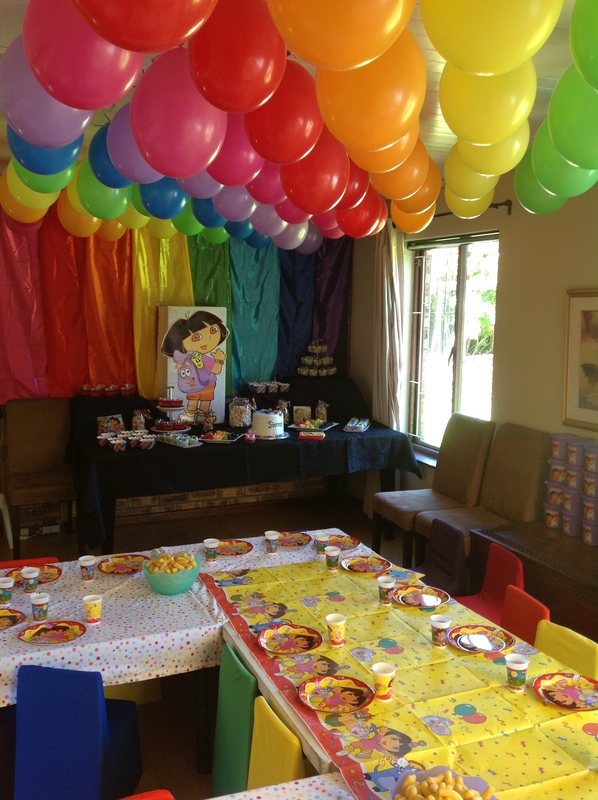 We bought discounted fabric in each rainbow colour that we draped down the back wall of the entertainment area. 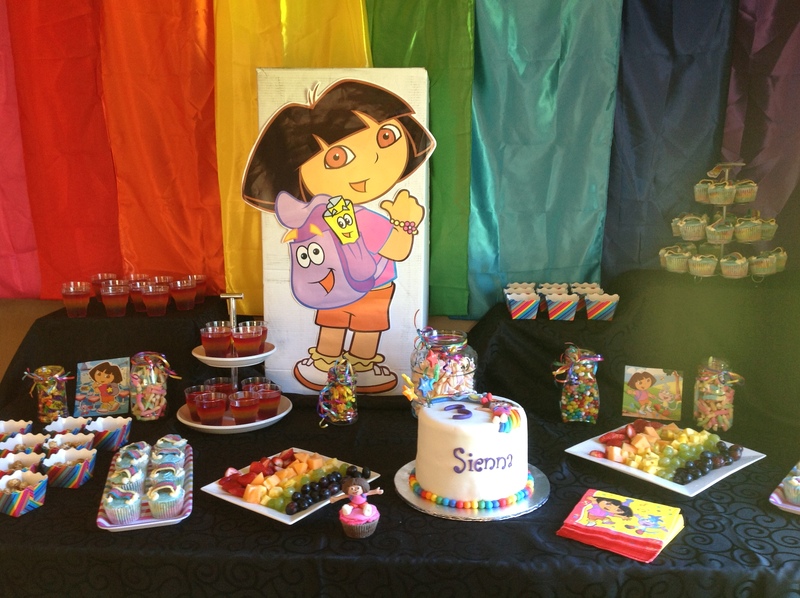 The table was covered in a black tablecloth to offset all the rainbow colours and we stuck a huge picture of Dora against the wall. 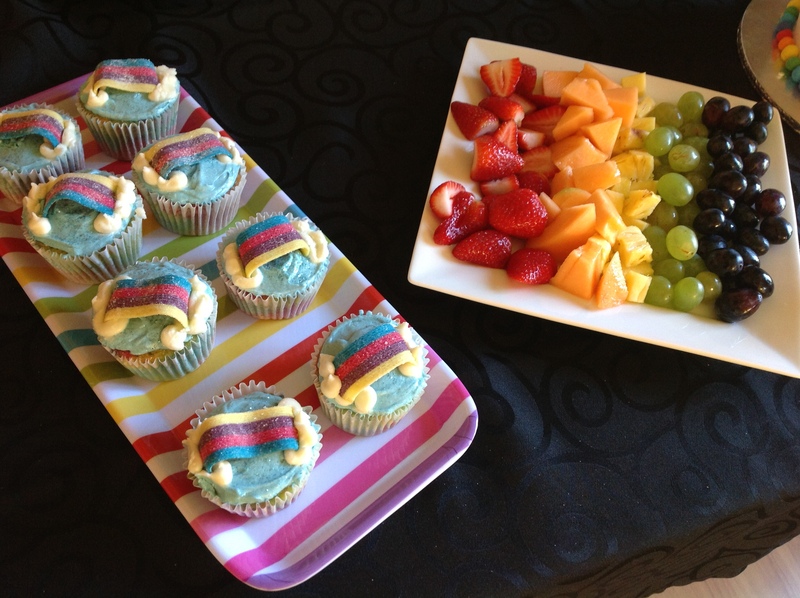 Apart from the amazing rainbow cake, we also had the rest of the food rainbow themed. pineapple, green grapes and purple grapes (blue berries were unfortunately out of stock). Lots of sweet jars on the table had brightly rainbow coloured sweets and marshmallows. We made rainbow jelly in clear cups which the kids loved. Also found cute rainbow coloured boxes that we put popcorn in. 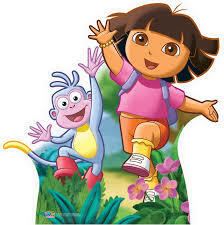 The main party activity was an Adventure as any good Dora party should have! And of course an accompanying MAP! 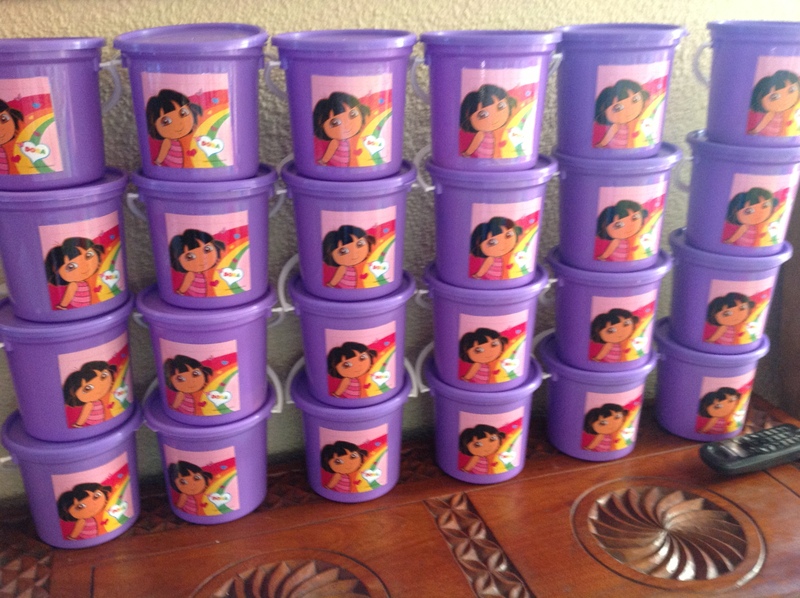 Instead of a backpack, all explorers were issued a bucket and sunglasses. We had “stations” such as a giant shape sorter, a tent filled with newspaper where they had to search for Dora stickers, glow in the dark stars that were hidden in the tree, a chair bridge to cross, a jelly (gelli baff) pool to wade through and a fishing pool to fish out their floating party jars filled with yummy treats. Great fun was had, and now our little girl is already planning next year’s party! At the moment it is a Peppa Pig Princess party (note the double theme again!) although anything could change between now and March 2014!